Financial assistance and charity care are available to patients that apply and qualify. If you need help filling out the application, contact one of our financial counselors at 423-778-5150. In addition to helping with charity care, our financial counselors are here to help you figure out if you can get TennCare or Medicaid, and how to pay for your care. If you don’t qualify for financial assistance, we allow some patients to make payments on a monthly basis. Erlanger will use outside agencies for debt collection, as needed. And when appropriate, legal assistance is used to collect payment from those who have the ability to pay. A Managed Care type discount will be applied to all self-pay accounts in accordance with Tennessee Code Annotated § 68-11-262. The selfpay discount is computed by the Tennessee Hospital Association, which sets a maximum collection rate for uninsured patients. These discounts do not apply to programs or services that are elective in nature. Examples of elective programs or services include (but are not limited to) wellness programs, cosmetic procedures, etc. Elective programs and services have specific pricing and are exempt from qualifying for charity care. The Hamilton County Assistance Program applies to all Hamilton County residents who qualify for charity care under the abovereferenced federal poverty guidelines. Hamilton County residents who meet Erlanger’s charity care criteria are qualified for both in-patient and out-patient Erlanger services for a six-month period of time. We utilize 340B medications for qualified patients of the hospital as that term is defined and applied within the Federal 340 B Drug Discount Program, see policy PC 220 340B Drug Purchasing and Compliance Policy. For Erlanger hospital billed services, patients with health insurance (government, commercial or managed care insurance) will be eligible for a 10% prompt pay discount on balances that are the patient’s responsibility. Payment must be received and posted within fifteen (15) days from the date of the first statement sent to the patient. 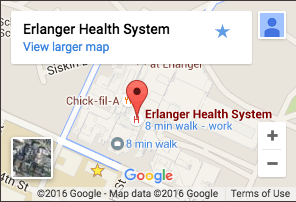 This prompt pay discount does not apply to Erlanger physician services billing. Efforts will be made by Erlanger to collect balances in full either by cash, check or credit card, prior to establishing monthly payment arrangements. Payment arrangements may be granted only after all other payment options have been exhausted. In lieu of payment arrangements, Erlanger reserves the right to refer eligible patients for bank loans to pay off their hospital account. Erlanger does not charge interest on monthly payment plans, therefore long term arrangements are discouraged wherever possible. The minimum monthly payment is dependent on the balance of the account. See full policy for details. Approval by the Director of Patient Financial Services or another designated person will be required if the payment made is less than required by the payment schedule. Please call Patient Financial Services at 423-778-5150 to speak with a financial counselor.